(may not be secreted) FIGURE 18-1 Structures of pineal chemicals. tion of the frog's pineal complex (epiphysis) and retina are evident in Figure 18-2. There appears to be a photolabile substance absorbing maximally at 560-580 nm in the frog or around 500 nm in other species. Presumably light energy is converted to electrical energy and hormonal output. FIGURE 18-2 Neuronal organization of the pineal complex of the frog in comparison to the neuronal circuitry in the retina. Epiphysis: R, photoreceptor cell; M, multipolar nerve cell (interneuron); P, neuron contributing to the pineal tract. Retina: R, receptor cell; B, bipolar cell; H, horizontal cell; A, amacrine cell; G, ganglion cell of the optic nerve. A, G, M, and P are acetylcholinesterase-positive elements. Reproduced from Oksche A. (1980). The pineal organ—a component of photoneuroendocrine systems: Evolution, structure, function. In "Hormones, Adaptation and Evolution" (S. Ishii, T. Hirano, and M. Wada, eds. ), p. 129. Jpn. Sci. Soc. Press, Tokyo. alocytes (Figure 18-3). Sympathetic noradrenergic innervation becomes more pronounced, so that light information coming in through the lateral eyes and sympathetic efferents replaces the direct response to light characteristic of pinealocytes. Ultimately the effects of pineal messages involve color change, endocrine control of reproduction, pho-totactic and locomotor reactions, detection of polarized light, and rhythmic phenomena. Clearly, the pineal gland is an important component of the photoneuroendocrine system. 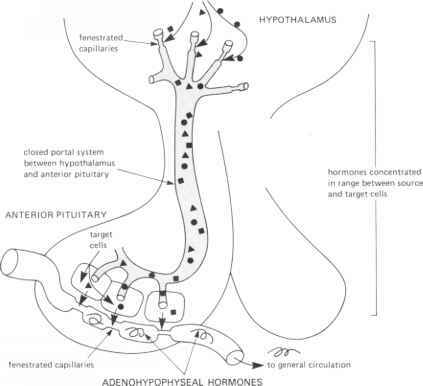 Wurtman and Axelrod (1968) describe the pineal as a "neuroendocrine transducer which secretes a hormone, melatonin, in response to norepinephrine release from its sympathetic nerves, especially noctur-nally, when the nerves are firing most frequently, and whose hormone provides the brain and possibly other organs with a time signal that cues other time-dependent physiological processes such as gonadal maturation, gonadal cyclicity, and perhaps sensitivity to environmental stimuli."